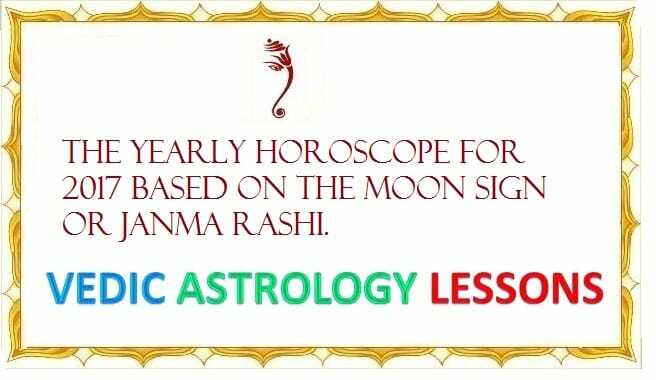 The yearly horoscope for 2017 based on the Moon sign or janma rashi. Planets like Jupiter, Rahu, Ketu and Saturn transit would influence in yearly horoscope predictions. Other plant transits like Sun, Mars, Venus and Mercury would exert their effects on monthly horoscope prediction. We will be presenting periodically in monthly horoscope section for the year 2017. Monthly horoscope prediction will be much more detailed than this 2017 yearly horoscope prediction article. Jupiter is in Virgo at beginning of 2017. Jupiter transits take place on 11th August 2017 and moving from Leo to Virgo sign. Jupiter stays in Virgo till September 12th, 2017. Already we gave in detail about Jupiter transit prediction 2016 – 2017. Jupiter becomes retrograde on 6th February 2017 and stay in that retrograde position for next four months and resumes forward motion on 9th June 2017. Saturn will continue the year 2017 in Scorpio. But in the year 2017 Saturn transits three times. It is moving back to Thula and again transit to Scorpio. First, it moves back to Dhanu (Thula) on 26th January 2017. Second transit happens on 21st June 2017. This time it transits again to Scorpio. Third transit will take place on 26th October and moves back to Thula and Saturn will stay there until the year end. In between these transit, Saturn becomes retrograde on 6th April 2017 and resume progressive in 25th August 2017. So Sadhe Sati will continue for Libra, Scorpio, and Sagittarius Rasi/Sign individuals. Rahu and Ketu transit will take place on August 2017. Rahu will transition into Cancer and Ketu would be in Capricorn. There will be no long term aspect of another planet during this year. Another planet Mars, Venus, and Mercury moves through almost all the signs during the year. The transits of Mars through houses 7th and 8th are consecutive Manglik house transits. Mars has no retrograde motion in during the year 2017. The following Rasi/Sign Taurus, Leo, Scorpio,Capricorn, and Pisces will get positive result until August 2017 and Aries, Gemini, Cancer, Thula, Sagittarius and Aquarius Rasi will get medium results until August 2017. After Rahu Ketu transit in August things will get change slowly. Major changes can expect after Jupiter transit in September. At the beginning of this year, Saturn and Jupiter, despite being slightly in an unfavorable condition. Yet, the Lord of the Zodiac sign and Ketu (the north lunar node) are in the 11th place so after a slight delay, the efforts will get the victory. The recession in the business will change, will receive business loans, the troubles in the collaborative business will be removed and the situation will turn favorable, the interference of indirect competition and competitors in business, commerce and employment will be reduced. The will be profit due to new customers, for those employed, the conflicts with higher officials and colleagues will be removed and the situation will turn favorable. Job seekers will get job opportunity and those trying for abroad jobs will get their efforts rewarded, some will receive increment along with transfer. This year all money dealt loaning and owing issues will get solved and the money that is being owed will come back in hand. There will be a reduction in the health expenditures in the family. There will be a relaxation from mental, physical depression and anxiety. Relatives and friends will give lend hands for help. Long days of efforts will end up in success; costs of futile drifting will get reduced. There will be an unexpected financial upcoming, unforeseen benefits through strangers, oversees business contract and profit through business. The efforts of buying new home and vehicle through bank loan will succeed. New friendships will bring benefits and improvements. As earlier in this year, the Lord of Jupiter zodiac sign meant for nature and auspicious is disappearing at the 6th place due to the sighting at 10th, 12th, and 2nd place. There will be a slight improvement in business and employment after a transfer or relocation. New job opportunities will knock on some people. Will receive the opportunity of long day wishes of touring overseas and visiting pilgrim places. The auspicious occasion in the family will seek expenditure. New investments in land and share markets will lead towards profit, though there will be a well suffice amount of cash flow one must be careful until August month. The state of depression in studies will get altered and the students will experience an increase of involvement and attention on studies, there are opportunities to attain the desired mark through effort. Don’t worry about vain concerns, be confident. This year will a year of providing more benefits on new efforts and confidence on every action. The sin will get reduced and good deeds will increase if a good Dasa and Bhukti occurs in your birth horoscope. Divine worship of Ancestry Lord, divine worship of Lord Muruga on Tuesdays, affordable people can travel to Thiruchendur and worship Lord Muruga directly and be providing food to destitute children will also be beneficent. At the beginning of this year, Lord of Zodiac sign Venus is placed in the 10th house and planet Jupiter are in favorable condition so you will get the more positive result in this year. Saturn is aspects Rasi (1st house) from 7th place and the time of ashtama Sani (Saturn)(8th place) begins and though it provides work hindrance and delay. Jupiter aspects on Jenma birth star, 11th house, and 9th house indicates victory at 11th place, but as the blessed position is sighted at the 9th place the sins will get reduced and good deeds will increase same as the snow melting at the sight of sun earlier this year. Many will experience a new relocation or transfer of business and employment. More trips related to employment and business will take place, abroad employment efforts will end up in success. There will be good suffice budget and there is a chance of getting new loans easily. There will be advantageous benefits through elder siblings and stranger friends. Ascendance will occur due to employment and business trips. Some will experience that the issues related to family (paternal) way properties will get easily solved and will receive their property. The long day desire of visiting pilgrim places, ancestry Lord and temples of favorite Lords will happen and will return worshiping there. It’s good to be a bit careful of all new efforts taken at the later part of the year. There are chances of conflict formation with the business partner or colleague through employment, business, newly invested collaborated business, new friendship, and customers. Be careful while signing the papers on foreign-related commerce, share market investments, expansion of business, providing money or receiving money on a new vehicle, home, and land. It’s good to recheck more than once before signing. Prevent providing hasty sureties for other. Be careful while driving and there are chances of increase in medical expenditure in the family. Students will need to concentrate more on studies. It’s a time to increase the confidence in your thoughts and actions. It’s good to reduce speed in action and implement sanity to prevent the loss and lose. There will be a delayed victory for acts. The sin will get reduced and good deeds will increase if a good dasa and bhukti occur in your birth horoscope. Worshiping Goddess Amman every Friday and providing food, clothing and possible help to elderly people and disabled people will be beneficent. At the beginning of this year, as the Lord of Zodiac sign Mercury is watching Rasi from the 7th house there will be a good improvement in employment, business, and commerce. There will be a growth economically. There will be an increase in thoughts and actions and will stay healthy. The previous debts taken for business will be paid back. Chances of receiving new bank loans. Some have higher chances of getting new land, home, and home appliances through the bank loan. Efforts of foreign and abroad jobs will be victorious. The hidden competitors in employment and business will back-off. Most of them who are employed will receive an increment with transfer or relocation. There will be an increase in expenditures on auspicious occasions in the family. Some will receive wife side properties and there will be the benefit through relatives. This year after the transition of Saturn it’s good to be more careful on new actions and collaborative businesses. Think deeply on issues related to new investments, business expansion and hiring new employees. Physical and mental depression will arrive and diverge, chances of increase in forgetfulness and pre-prepare the requirements for everything. Prevent indulging in two jobs or actions at the same time. There will be chances of increase in long trips related to employment and business. It’s not good to indulge in new collaborative business and share market, there are chances to get betrayed by trusted people and there are chances of the rise and solving of conflict with colleagues and higher officials in employment. There will be an increase in the thoughts of transfer and relocation so have patience. There are chances of thought conflict between husband and wife that will get solved, it’s good to give up and there are chances of conflict with relatives and friends on collaborative business. Your new efforts and actions will succeed after a slight delay. Patience is compulsory. Students have the chances of getting dull and forgetfulness towards studies, you don’t have to fear or worry if more concentration is implemented on core subjects. The Saturn transition that occurs this year will be favorable to you, work hindrance and work delay will get removed, auspicious efforts such as marriage will end in success. Stop worrying, don’t depend on anyone on any action instead act on with your own effort with little bit of concentration, though it delays success will be yours. If your birth horoscope has good Dasa and Bhukti, then sin will get reduced and good deeds will increase. Worshiping Hanuman and Perumal every Saturday and Wednesday will be a remedy and providing food, clothing and affordable helps to destitute children will also be beneficial. Rasi Nathan Chardiran begins on 7 to study Rasi. This year would be filled with joy and prosperity. You’ll obtain creativity and interest in work. Auspicious efforts like marriage would be successful as per your wish. Husband gets help via wife’s lineage. You will get profit in combined profession, new commercial, foreign relation, and investment in business and get Professional loan easily. Transfer in job and increment of salary will be favorable to you. You will get money unexpectedly also. This year, you will have frequent journeys. You will get to live your dreams of visiting pilgrimage places and tourist places. A Few people will get a chance to go abroad. You will be interested in visiting your favorite God and profit from the property via father’s lineage. This year Saturn transit (Sani Payirchi) would be in your favor. situated or placed of the 6th house, will provide favor of Saturn God.You will succeed in fields such as professional development, income, civil cases, and get the fair income of money. Rahu in 2nd house and Ketu in 8th house are slightly in an unfavorable condition. So, you should be cautious in activities such as offering and receiving money, authorization of getting money for others, journey on vehicles and make sure your vehicles are in a good condition. Food and manner of food consumption may affect your health; so, prefer homemade food. As well, your meals should not be untimely. Indistinct health and its consequences would otherwise turn out to be expensive. Unnecessary arguments should be avoided at your workplace and with your family to admonish misunderstandings and hence protecting your reputation. Jewels, debt, and pledge are expected this year; take care while lending or borrowing them. While you’re out of home wearing jewels, extra care should be taken. Students will find interest in education; those who wish for higher education will find admissions as they desire. Controlling your talkativeness and concentrating more on making clever decisions will help you triumph. Siva worship on Monday, worship of kaali Amman, Durgai on Tuesday; feeding the destitute and poor people will reap you best results. At beginning of the year, Lord of Zodiac Sun is placed in 5th house, Lord of 9th house Mars and 10th house Venus aspects the Zodiac sign from 7th house. These planet combinations are in favorable condition so you will get the more positive result in this year. This year will lead you a lot of good incident in your life. Hence, this year will entertain several auspicious events in your life. The Jupiter in the second house (Dhana Sthanam), will assist you to obtain positive results. Withheld auspicious events within your family shall progress wholeheartedly. You expenses shall go up this year; investing your money in land and property is advised for positive results. Interferences in industry and workplace will be resolved, and indirect competitors in business will stop getting in your way. Long lasted unidentified diseases and pain shall retreat, and your health condition will improve; thereby your medical expenses shall drop. You can expect the unexpected and regular flow of money, and as your unnecessary expenses go down, you’ll save more money. Relatives, friends etc. shall return the money they owe you. This year, people with an occupation in insurance, medical and policy will be benefited. Employers looking for appropriate employees to form a reliable workforce will meet their desire. You previous debts would significantly reduce. You can expect loans on the basis of your land, home, and fixed assets. You will observe favorable verdicts in long lasted cases. Until Rahu and Ketu transit, you’ll observe fatigue, premature anger, confusion, and friends cheating on you. You’ll have to weigh the situation precisely before making a decision. A tiny problem would seem very big and unmanageable. Stop whining and worrying yourself thinking about regrets from the past. The relationship between husband and wife would face marginal stress, and shall soon pass. It is advised to understand each other and arrive at mutual consent. You should be concerned chiefly about your health. Friends and recent professional partners might account for monetary losses. Students will be required to concentrate more on their education. To maintain mental peace and stability it is advised to practice yoga and meditation. Being independent and leading your own way shall assist you to triumph ultimately. In your birth horoscope, if the right direction and sense happen to be, you’ll be exorbitantly benefited. On Wednesday, the certain period of Rahu Kaal: praying to Amman and helping the destitute elders shall obtain maximum benefit. Jupiter in 1st house (Genma Guru) yields in drift, confusion in the decision; and the ruler’s, Jupiter’s, vision is firmly at the 7th place. Hence, unmarried Men and Women would find offers pouring in. Split up families would reunite. The business of selling and buying will be progressive; such as agriculture, house, and apartment flat, vehicles. Maternal relatives will help you. The nature of Rahu and Ketu are positive so you’ll be interested in catering to attitudes and actions. Several people will get repeated opportunities to go abroad for a job and/or field related ventures. You will benefit from commercial occupations abroad and you’ll settle pending loans with your recent profits. Indirect competitors will disappear in the business. In the business or work, top officials maintain the smooth trend. Saturn transit is slightly favorable this year, however, there is no need to worry about anything. New initiatives, the monetary exchange between friends, vehicles and long journeys, should be dealt with caution. Consider and weigh the situation twice before giving credit and as well signing bail to others. Medical expenses are probable in the case of physical exhaustion. At beginning of the year, Lord of Zodiac Venus, the ruler of your sign, is in the 5th House (trikonakam), bringing you good fortune throughout this year. The Saturn transit occurring this year will result in the completion of the last stage of Sade Sati. The misfortunate happenings that befell you till this time – debt, betrayals, standstill work will all vanish from your life. Your career, business will take a new upturn and will start running in full swing. Your physical ailments, tiredness, stress will be wiped out and you will feel a completely renewed. Couples living separately due to work reasons will be united. Those who are separated due to differences of heart will also face a happy reunion. Though Jupiter is in retrograde in the 12th House, the ruler of the 6th House will shower good fortune in terms of financial gains. Your wasteful expenditure will be curbed and your spending on festive occasions will increase. Land acquisition can also be expected. Jupiter though in the 12th position is facing his 6th House; therefore you will gain in business, job promotions, winning court cases, and a good windfall of money. Your previous debts will clear slowly; you will avail new loans for your business ventures. People running their own businesses will get qualified people for working under them. Enemies working behind your back will stop destabilizing you. Rahu (the North Node) is in your 11th House of gain and victory. This will result in success in your new endeavors. Your relationships especially your friends, elder brothers and new persons will prove beneficial to you. Import/ Export businesses are favorable. For some, there will be opportunities for travel abroad. Those in entertainment, sports, and stock market businesses see good professional progress. Kindly take care of your health; medical expenses will come down. Students will see their interest in academics increase, resulting in the good performance in the exams. Your past experiences due to the unfavorable planetary positions would have revealed your true friends who trust and believe in you. This is the time to forget the painful past and focus on your work as Time is in your favor now. Depending on the planetary positions at your time of birth, the current transitions will see your bad luck turning and the start of good fortune in your life. Chathurthi Pooja for Lord Vinayaka, Friday Goddess Durga worship, donation for decrepit temples, providing food for orphanages will give you exceptional results in your life. At beginning of the year Mars, the ruler of your sign, is in the 4th House, while Jupiter, the Lord of good fortune, is in the 11th House. This year will see your troubles unraveling and you will take firm steps towards growth. Unnecessary expenditures will come down, along with your family medical expenses and debts. Your income will be sufficient to meet your needs. For your sign, this year indicates the end of Saturn’s rule in your birth sign. Obstacles in important activities, setbacks in decisions will all melt away. Industries that faced slow growth will pick up. For some, a change of place is indicated for growth in their careers, business or occupation. Problems in ancestral properties will be resolved favorably. Your interest in ancestral deity worship will increase. Childless couples will have reason to smile as their prayers will be answered. You would have faced betrayals over signing bail, loans, and job opportunities. Your planetary positions indicate you to be careful this year too. For some of those living separately due to work, this year planetary transitions bring you closer to your family. The presence of the North Node in your 10th House indicates an increase in your job responsibilities. But accordingly, your position will also rise. You will not face unemployment issues anymore. Kindly refrain from changing jobs frequently. You will have differences of opinion with your superiors and co-workers, but those issues will resolve themselves. Those in the import/ export businesses face good growth this year. The presence of the South Node in the 4th House will have some effect on your health in small ways. Kindly take care of your health and food habits so that the ill-effects are not aggravated. Students who have been facing difficulties in learning will see their academic performance improve greatly. For some who had to leave their studies mid-way will have the opportunity to resume their studies. Well-researched and planned actions will result in success for you this year. If the planetary positions in your birth chart are favorable, your ill – luck will decrease and you will succeed in your activities. Worshipping Lord Muruga on Tuesdays and helping the poor will bring the great benefits to you. At beginning of the year Jupiter, the ruler of your sign is in the 10th House and Mercury the ruler of the 10th House is in your birth sign. This year sees your thoughts turning towards trade, business, and work. Working diligently with careful planning will bring success, even if the results are delayed. This year Saturn transits from your expenditure House to your birth House. So this year you will face some delays in new projects, differences of opinion with your family members, friends, and co-workers. Be calm and refrain from unnecessary poking into issues of other people. Think twice before accepting to sign the loan/ bail guarantee in any issues and any monetary transactions with people, whether unknown or known. Some will face new competition in their business; a few will see a change of location. Those changing jobs should be cautious and should ensure that they consolidate their new offer before leaving the old one. Most new jobs will be in different/ far-off locations. A few of you will have to move away from your family due to your occupational requirements. Loans through land or gold can be easily obtained. This year will see you traveling frequently due to your job. Foreign travel is indicated in your cards. Some needless travel, physical and mental exhaustion will fail you frequently. The practice of yoga and meditation will help alleviate your stress. Be careful in new joint ventures and investments as you can have differences of opinion with your co-investors. Telecommunications, foreign-related businesses, small businesses are profitable this year. Students should focus on their studies and work hard. They will face memory loss and laziness. After the transition of Jupiter this year, you will receive good job offers, promotions, and incentives. Do not lose heart over your difficulties. Put your heart in your work and leave the rest to God. Everything will turn out just fine. Worshipping Lord Guru on Thursdays, Tuesday Lord Muruga worship and feeding poor orphans will be immensely beneficial. At beginning of the year Saturn, the ruler of your birth sign is in the 11th House and Jupiter is in the 9th House, facing your birth sign. This year will see you change your location for work, investments in land/house, and travel. Your income will be sufficient to meet all your needs. Your expenses for festive occasions like marriage in the family will increase. Some will buy lands and houses as the time is favorable now. Your friends, new members will prove beneficial to you. You can expect the change of location in your work and business. Though your workload will go up, your salary will increase. This year Saturn transits to your expenditure House, resulting in poor performance in business and trade and change of location for some. Be careful while buying new properties like land, gold, house, etc. You will face the financial deficit, medical expenses. Think twice before signing personal guarantee even for close friends. Be careful in your monetary dealings with everyone including your friends. You may face new competition at work, business. Be careful to consolidate your offer contract at the new company before resigning from the old job. Those searching for new jobs will be likely to get offers from distant locations. You might experience theft while traveling, so be careful. Those trying for overseas jobs/ studies will succeed in their endeavors. Do not indulge in arguments with your co-workers, family, and employers, as it might lead to sour relationships this time of the year. For some, estrangement from their family due to some issues is on the cards. While for some, they might have to shift from their own houses to rental ones due to work. The 2nd, 6th, and 9th Houses of your sign are impacted by Saturn. This will result in family expenses due to your brothers, though you can obtain loans easily. Some parental relations might prove troublesome this time of the year. At the same time, Jupiter is in your 9th House and also impacts the 3rd (birth sign House) and 5th (karma) Houses of your sign. Therefore you will face your troubles with the help of God and come out winning. Any misunderstandings with your brothers will resolve smoothly. Disputes in ancestral properties will solve favorably. Childless couples will be blessed with children. Undertaking any job with your own strength and not expecting others will lead to success ultimately, though it might get delayed for some time. You will gain from your business related travels. Students will have to work very hard to achieve their goals. But hard work and determined focus in important subjects will surely lead to success. Worshipping Lord Narayana on Saturdays, Lord Hanuman worship, helping the old and people with special needs with food and clothes will see you through these times safely. At beginning of the year Saturn, the ruler of your birth sign is in the 10th house and Lord of 10th house is in your Ascendant House. This plant exchange will increase interest in the job, business, and commerce. At the same time, in the North Lunar Node (Ketu) of the horoscope, the South Lunar Node (Rahu) is situated at the 7th place and Jupiter at the 8th place. So, there will be an increase in family’s health expenditure. There are some chances of getting into disputes with friends and relatives so it’s best to avoid useless arguments. The money flow will not be as good as it is, so be careful while lending and owing money. It’s required to concentrate more on self-health. Some may receive negative news from court cases regarding Business and employment. The land and house that haven’t got sold for a long period will get sold now. Jupiter is sighting the horoscope at 2nd, 4th, and 12th places, so there will be good money flow depending upon the job. After certain hurdles and delay the efforts inputted will succeed. There are chances of sudden money flow. Will get loans through the house, real estate, and vehicles. Some will be lucky to buy big properties through selling ancestral house, land, and property. The Saturn transition taking place this year for the horoscope at the 11th place will be a suitable place for the Lord of Saturn. Good deeds will increase; there will be good profit in Business, chances of promotion in Job and your thoughts will come alive. Worries will decrease, will attain joy and excitement will increase. There are chances of getting benefited through elder brothers, the money that is to be received will come in hand, all the business loans will get settled and there will be enough money flow. The expected events that have been delayed for long days will succeed. As the Lord of Saturn is sighting the birth horoscope at the 5th and 8th place, so some will get their disputes on ancestral properties solved and there are chances of getting medical treatment for long-suffering health issues. May get the loan in the name of land and properties. Stop worrying and head on with efforts. Even if delayed, will surely get the victory. If there are good dasa and bhukti occurring in your birth horoscope then all the sins will get reduced and the beneficent through good deeds will increase. Worshiping Amman during Fridays and worshiping Perumal during Wednesdays can act as a remedy. Moreover, providing food, clothes and affordable help to the destitute children can also be benefiting. At beginning of the year, Jupiter is aspects the Ascendant from 7th house, this will result in auspicious happening related to you in your family in the matters of marriage, house, real estate, vehicle etc. As your horoscope receives the sight of Saturn, your efforts and actions will result in victory. Your status, wealth, and wordy power will increase. Particularly, the economic status will be very good. The amount that is to be received will reach the hands. You will attain a higher place in employment and business. Will also attain merry heat and excitements. Some will receive increments in the job and the desired transfer. Matters related to business, commerce, business expansion, initiation of the new branch and small business efforts will end up in success. The discreditation occurred earlier will get removed and the hidden competitors and enemies will evade. The relationship between husband and wife will be healthy, auspicious occasions such as marriage will occur in the family, chances to buy house appliances, ornaments, and important materials. Bachelor’s will get married and couple with delayed pregnancy will beget children. People involved in politics and social service will get more audience influences. As the birth horoscope of Saturn is sighting at 3rd and 11th place the mental depression will disappear, excitement and happiness will be created, there will be benefits through siblings, efforts will be successful and lucky. This year the Lord of Saturn is transiting from 9th place to 10th place for your horoscope. Competitions will occur in employment and business, the workload will increase, your talents will get revealed and tiny drift will provide tiredness. Will get involved in public service and social activities. Some will experience a transformation in Job and business and will get business loans. Be more careful on business investments and employment of employees. At the same time, small disputes will occur and disappear between new friends and business partners. Verify the bonds related to house, land, and business before signing. Business-related foreign efforts will be victorious. People trying for the new job will get a job. The Lord of Saturn is sighting the horoscope at 12th, 4th, and 7th positions. Some will experience a situation of selling or exchanging house and vehicle. There will be an occurrence of slight health issues. This may create tiny disputes between husband and wife. Prevent useless arguments and give up on such issues. If you work on a plan, this is a time to work out all your long time dreams and thoughts. If there are good Dasa and Bhukthi occurring in your birth horoscope then all the sins will get reduced and the beneficent through good deeds will increase. Worshiping the Lord of Saturn every Thursdays and worshiping Amman every Fridays can be the good remedy. Providing food and clothes and other affordable helps to the destitute children will be beneficent.